It might sound more like a day at some odd county farm fair than a day at the crag – with Snargs, Warthogs, Peckers, and Screws. But, they’re all gear some of us have carried over the years in the name of safety on the ice. Things have really changed in the past thirty years with regard to how we ice climbers protect ourselves while climbing frozen pillars. 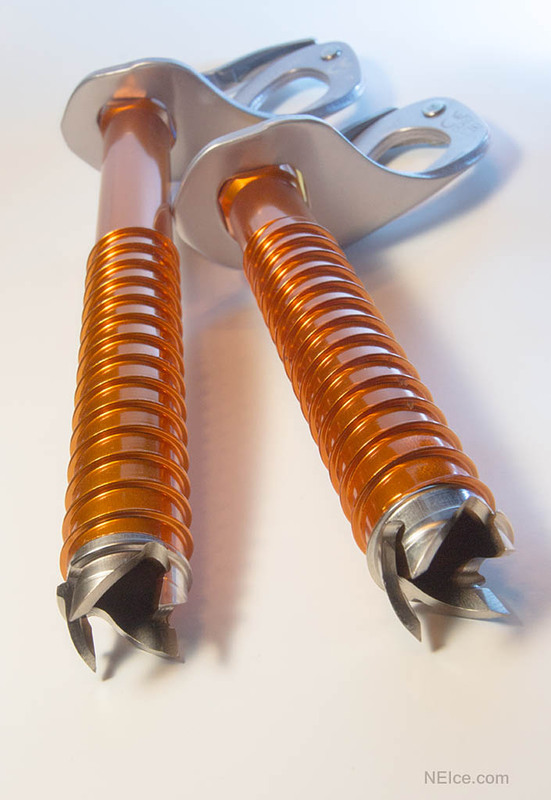 Modern ice screws weigh less and go in far easier and faster than they ever have before—fortuitous considering that climbers are progressively delving into steeper and thinner ice flows. Older climbers will remember the loud, groaning squeak that often emitted as you worked hard to turn a screw into the ice. Once started in a hole, the complaining screw started sounding more like…turning a rusty old bolt on your dad’s 1972 Chevy truck. You would stick the axe pick into the hanger and then cranking hard on the axe handle, leverage the screw around to drive it into the ice. Often it took a couple of minutes just to get one deep enough into the ice before you could safely clip a rope with a big sigh of relief. This almost guaranteed a vicious arm pump and numb fingers inside your wool mittens. Nowadays though, by wielding a rack of modern screws, a climber can safely place several screws in less time than it took to place any kind of ice gear three decades ago. With the recent advent of Petzl’s Laser Speed Light ice screws, a rack of eight 13cm screws, three 17cm screws, and one 21cm screw end up weighing in at just a mere 2.5 pounds! This is a savings of more than a pound and a quarter even when compared to a modern rack of similar-sized Chromoly steel screws. The new technology cuts more than half of the weight off what a standard rack of screws used to weigh twenty years ago! Add in a dozen super-light quickdraws at just a pound and a quarter (just forty five grams ea.) and you are now rocketing up a route! Modern climbers are essentially carrying ten pounds less on average for protection up their routes. A strong ice climber can often place an ice screw in virgin ice in about fifteen to twenty seconds now. But, popular crowded routes can mean less untouched ice. Looking around, you find there’s plenty of pre-drilled holes. Should you just use those? Studies show they can have just as much holding power if the same brand screw is used. Yeah, I know what you’re thinking. How do I know? I don’t want to get screwed. So what’s the difference? NEice was wondering the same thing, so we decided to go with what some of the engineers are telling us all. Approximate screw tip diameters (unofficial) according to a report published by Black Diamond Equipment. BD’s Climbing Category Director Kolin “KP” Powick says, “At the end of the day, screws need to meet 10kN to pass required CE testing, and in the tests above where we rebored using the same screw, the results exceeded 10kN. However, when we used a smaller diameter screw (steel screw) in a larger diameter hole (aluminum hole), it resulted in the placement being compromised and the screw pulling out at reduced loads (significantly less than 10kN)”. Ultimately, the takeaway is, if you don’t know what screw was used to drill the old hole, don’t use it for a placement! If you have to, place a larger diameter aluminum screw in it. Also bringing a few longer screws will help with pre-existing holes to go deeper into fresh ice. 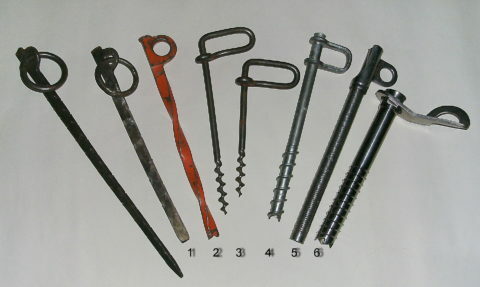 While the aluminum screws are lighter, they are not as durable as the steel screws. Ultralight screws are crucial for fast and light objectives in the mountains, but steel screws are your everyday workhorse. Remember, steel screws are stronger than aluminum ones, so if there is a partial failure which bends the screw, a steel one has a better chance of remaining intact. That’s something to consider if weight isn’t a huge factor in the success of your climb. How Heavy Is That Gear? Steel tube and drill, aluminum hanger. Non-folding handle. Steel tube and drill, aluminum hanger. Chromoly screw and hanger. No crank handle. Chromoly screw, stainless steel hanger (10Kn). Steel drill, aluminum tube, forged stainless steel hanger. Steel drill, anodized aluminum tube, aluminum hanger.